Crafted with nearly all of the same design principles and technologies as the Gallium Pro frameset that’s ridden by the pros of the German continental team BORA-Argon 18, this frameset is the perfect starting point for a high-performance all-rounder. 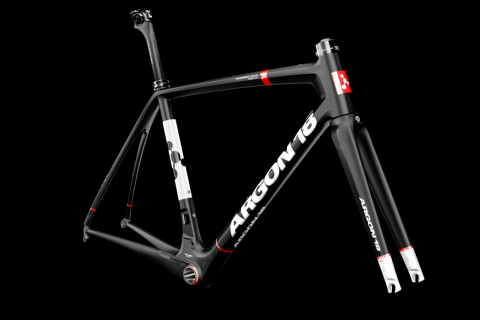 Redesigned last year with a new 6100 HM carbon composite formula, Argon 18 says it has a 17 percent better stiffness-to-weight ratio compared to its predecessor. The geometry of the Galium is aimed at giving riders sharp and agile handling for a variety of terrain and riding styles. It sits right in the middle of Argon’s performance road lineup between the Nitrogen aero road bike, which emphasizes low and aerodynamics for solo efforts, and the endurance-oriented Krypton frameset. If your typical training and racing program includes hilly terrain, and you favor an aggressive race-oriented handling, this is one you’ll want to consider. One feature that makes the Gallium special is its 3D System adaptability. This technology allows you to structurally adjust the head tube height so you can raise or lower the handlebar position without relying on traditional spacers. According to Argon 18 test results, raising the bar 15mm lets you retain 5 percent more rigidity compared to standard setups, and raising it 25mm saves 11 percent. As stated, the geometry of the Galium is made for racing—but it does feature a few small tweaks to smooth out the ride. Most notably, the bottom bracket has a 75mm drop, which helps lower the center of gravity to increase stability. It also adheres to Argon 18’s AFS Road Geometry, which basically ensures that the dimensions of the six different frame sizes are proportional and well-balanced—making it easier for riders of all different sizes to find that sweet spot for quick and nimble steering plus stability on fast descents or rough roads. The Gallium’s balance of stiffness and comfort is based largely on a concept Argon 18 calls Horizontal Dual System (HDS). Imagine a diagonal line running from the head tube down to the rear dropouts. Everything below the line represents the “Power Zone,” where rigidity matters most. In the case of the Gallium, that means an oversized head tube up front to ensure crisp, precise handling while cornering or sprinting, plus a massive bottom bracket area and asymmetrical chainstays to maximize every bit of energy you put into the pedals. This frame kit comes with the frame, a one-piece full carbon fork that weighs 350 grams (cut to fit medium size frame), the reversible carbon seatpost, and an FSA headset. It’s compatible with mechanical or electronic Di2/EPS components, internally routed with no added parts required.